Aaron Laux at work in his studio. One beautiful summer day, we visited artist Aaron Laux in his home studio, and he graciously gave us a tour while discussing his process and inspiration. We left with an even greater appreciation for his remarkable sculpture, lighting, and furniture—pieces that express his love of nature and dedication to environmental stewardship. Aaron believes that “to live with art is to live well,” and we couldn’t agree more. Fractured, an illuminated sculpture in Aaron Laux’s home. 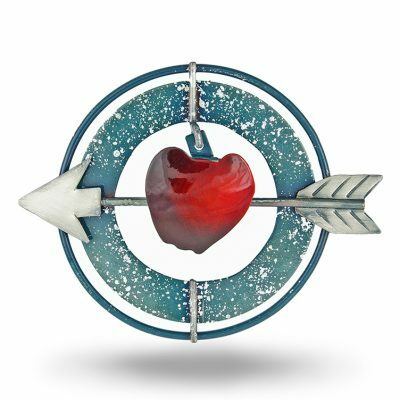 A long-time resident of Madison, Wisconsin, Aaron Laux states, “my heart is rooted in the upper Midwest.” His deep connection with the land informs his creative practice, which is revealed in the natural materials he uses and the organic aesthetic that defines his work. 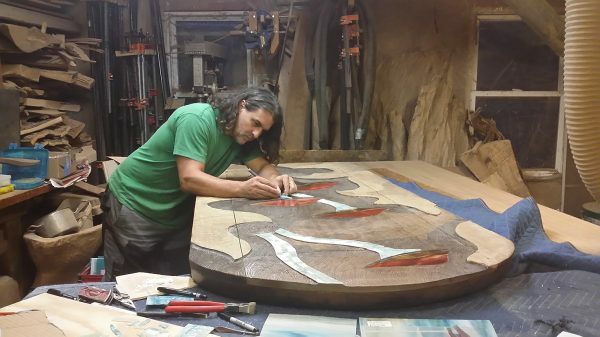 Aaron’s artistic training took place during a ten-year apprenticeship with furniture artist Steven Spiro. Spiro’s unique approach to woodworking—honoring the rich character of the wood while creating imaginative shapes and forms—was highly influential for Aaron. Initially drawing inspiration from his mentor, he has since developed his own signature style using local and reclaimed materials. Aaron Laux showcasing his work at a local art fair. Light Sculpture (left); Part of the Landscape Desk and Chair (right). 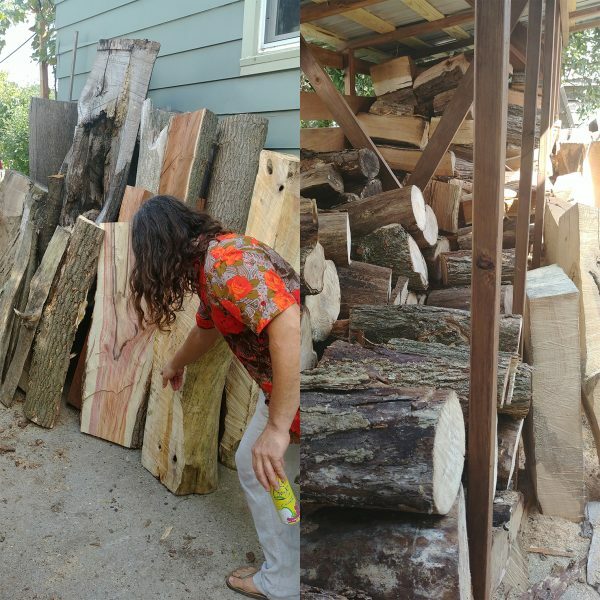 To that end, he is part of a group called Wisconsin Urban Wood, “a collaborative network recycling urban trees back into communities across Wisconsin.” Through this organization, he has access to local wood salvaged from tree cuttings. This means he always has a wide variety of native tree species on hand, from maple and oak to box elder and walnut. In every log and branch, he sees the potential for art. Aaron Laux shows us his collection of logs from local tree species. While showing us his supply of logs stacked in piles outside, he points out to us a few pieces that he’s especially excited about. One of them is a large piece of box elder, which displays rich grain patterns in a surprising pink hue. 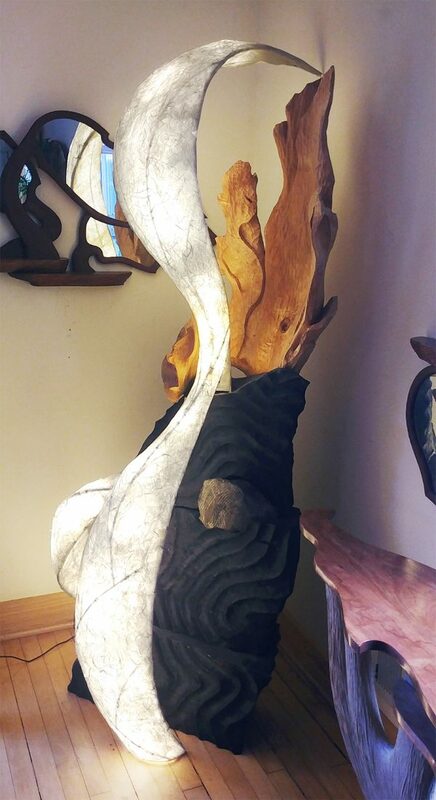 His sculpture “Wave Scape” demonstrates the unique beauty that this particular wood species can offer in a finished piece. The pink grain of a raw box elder log (left); the beauty of finished box elder in Aaron Laux’s sculpture Wave Scape (right). Aaron’s home reveals just how closely intertwined his life and artwork are. With his sculpture, lighting, and furniture displayed throughout, his living space seems to embody the same passions and ideals that he expresses in his work—especially his commitment to artistic beauty and connection with the land. 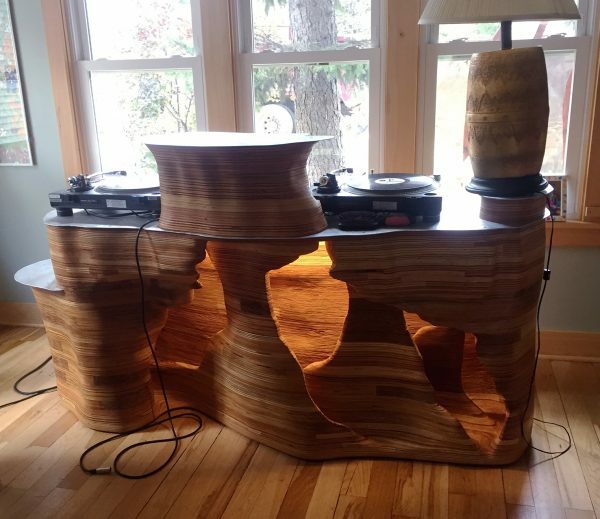 Reminiscent of geological formations, Sound Cave is a DJ table Aaron created for his wife—a focal point of their living room. After discussing some of the artwork inside his home, he led us into his backyard, a vibrant garden landscape. Vegetable beds, a grape arbor, raspberry bushes, and a chicken coop shared the space with stacks of lumber and a wood kiln. On the way to his studio, he showed us around his garden, offering us bouquets of basil and pointing out his fruit trees. Fruit trees and a painted fence enliven Aaron Laux’s backyard. In My Garden (upper right) is a wall sculpture inspired by the artist’s lush landscaping. Inside the detached garage that serves as his studio, the space was dominated by several large work surfaces, a table saw, and other tools and materials. Several in-progress pieces were on display amid the sawdust. Aaron talked a bit more about his techniques and tools. We loved getting a glimpse of where the magic happens. Inside Aaron Laux’s studio space, he shows us a piece in progress called Caught by the Current. 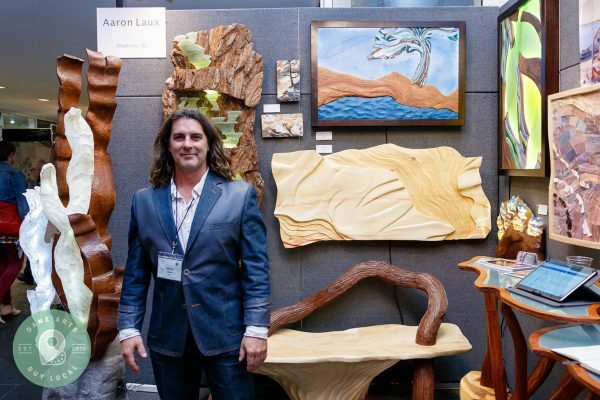 In everything he creates, Aaron Laux reveals his great imagination and enduring commitment to environmental stewardship. His art practice is deeply intertwined with other aspects of his life, which became especially clear to us during this visit to his home and studio. We were thrilled to meet him and we are very grateful that he welcomed us into his home and studio to learn more about his art. See more work by Aaron Laux here.